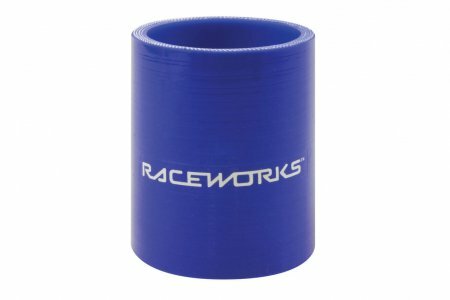 Raceworks 1.5″ / 38mm Silicone Joiner – 60mm – Blue. Raceworks Silicone Hose is manufactured from the highest grade materials, to ensure that the strictest OEM and performance specifications are surpassed. All hoses feature solid 5mm walls constructed from 4-ply reinforced silicone polyester, offering burst pressures of up to 348psi (see application table for individual ratings) and a temperature range of -40 to +180 degrees Celsius. 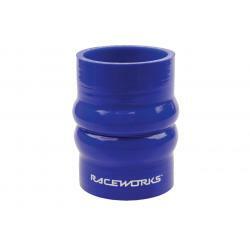 Available in blue and black, all hoses are UV, ozone and electrochemically resistant to avoid fading and separation. All Raceworks products come with a 2 year warranty. NOTE: Silicone hose is not fuel safe. 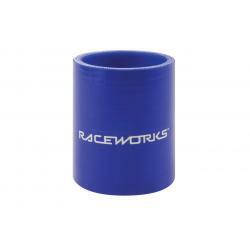 Temperature Range: -40 to +180deg C.
Fuel type: Raceworks Silicone Hose is not Fuel Safe.